I am employed at a no-kill animal shelter. 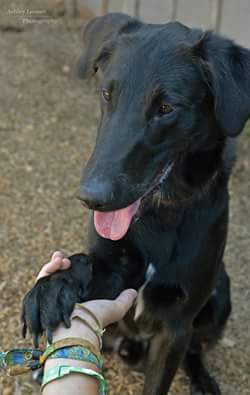 A couple months ago we received a very tall collie/lab mix. He is 2yrs old, recently neutered, and generally does well with other animals. However he is extremely reactive to new people/people that are afraid of him, bearing teeth, snarling and jumping.Veterinary procedures, even ear cleanings or applying topical flea medication can provoke full blown attack mode. He redirects if injured or wound up by the presence of a new person or certain dogs, again full blown attack mode. He has bit 6 times at least and enough to draw blood at least 3 in his 2 months with us. He had a bite history with his previous owner as well. Any behavioral suggestions/tips would be greatly appreciated. Recommended rescue facilities would be appreciated as well!